After spending the past six game-weeks playing against teams on the opposite side of the fence in cross-zone action, clubs in the Barbados Premier League are back home. With teams like Empire, Paradise, Ellerton and St. Andrew Lions all making the most of their time in the out-of-zone fixtures, this coming weekend will see the teams back to regularly scheduled programming. Weymouth Wales are back at the top of Zone 1 after a short stint that saw them losing four games on the trot. The two-time defending champions only bounced back in the last two games on the other side to see them to pole position on 17 points. The run of poor form has hit their record and the powerhouse sit on five wins, two draws and four losses. After holding the top spot for a short while, the University of the West Indies are back in second place with 15 points from four wins, three draws and four losses. Mark's Auto Spares Porey Spring did not have the best of times over in Zone 2 but still manage to be safe in third place with nine points from two wins, three draws and six losses. 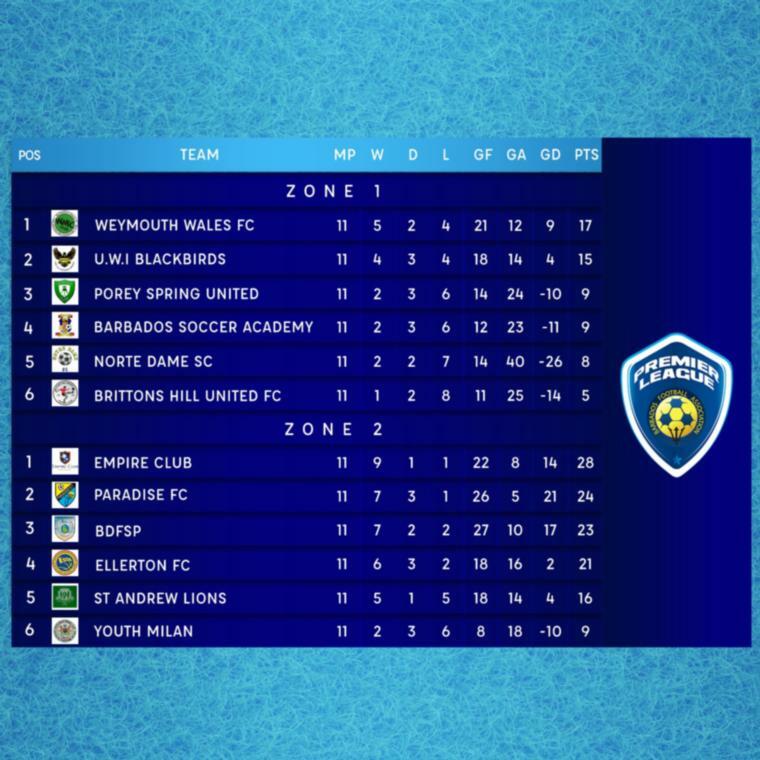 RBC Capital Markets Barbados Soccer Academy have the same points and identical stats in fourth place but have been set apart by an inferior goal-difference. At the bottom of the barrel are Clayton's Kola Tonic Notre Dame and Brittons Hill United and the two top-tier stalwarts have both seen better days. The Dames have two wins, two draws and seven losses for eight points while Brittons Hill (5) have only managed one win and two draws while losing eight games. Things went much better for Zone 2 teams with Empire continuing their march at the top of the group. The Blues rule the roost with 28 points from nine wins, one draw and one loss. Paradise FC had an almost perfect run punctuated by a single loss to Wales to see them to 24 points from seven wins and three draws. The Barbados Defence Force Sports Programme are holding out in third place with 23 points. Along with seven wins, they have an even split of two draws and two losses to see them to their total. Crane and Equipment Ellerton had the best run of any club in the cross-zone fixtures. Previously without a win, they went into Zone 1 and won all six of their games to see them to 21 points. Before heading over they had three draws and two losses. Scotty's Car Rentals St. Andrew Lions also had a fine time in Zone 1 as their record their saw them taking five wins and a loss after not taking any wins at home. Now with their sights set on taking forward their current form, they are in fifth with 16 points from the five wins, one draw and five losses. Youth Milan round out the group with nine points after taking just two wins, three draws and six losses. The League picks back up this weekend with triple-headers on Saturday and Sunday at the Wildey Turf. Up first on Saturday is a match-up between Porey Spring and the Blackbirds at 5:00 PM, while the Lions and Ellerton lock horns at 7:00 PM. The nightcap goes to the Sports Programme and Youth Milan. On Sunday, things kick off at 4:00 PM with the Soccer Academy and the Dames crossing swords. Game 2 features Weymouth Wales and Brittons Hill United while the 8:00 PM fixture will see Empire and Paradise mixing it up.